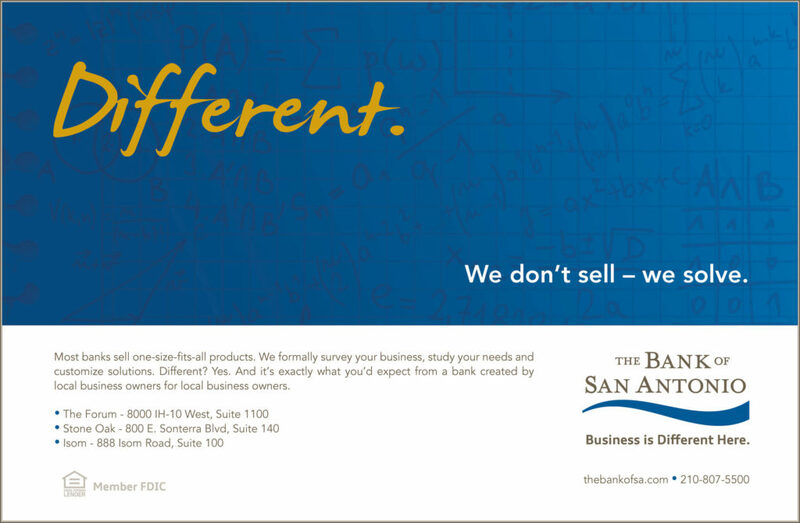 In 2010, The Bank of San Antonio was having difficulty establishing their brand image. They had been around since 2007, and were primarily marketed through word of mouth and a very limited number of print ads in local business and niche industry publications. To complicate matters, there was also some confusion in the marketplace with another bank of a similar name—San Antonio National Bank. San Antonio National Bank was dealing with negative press due to asset quality and earnings problems, which was a complete contrast to what was happening with The Bank of San Antonio. 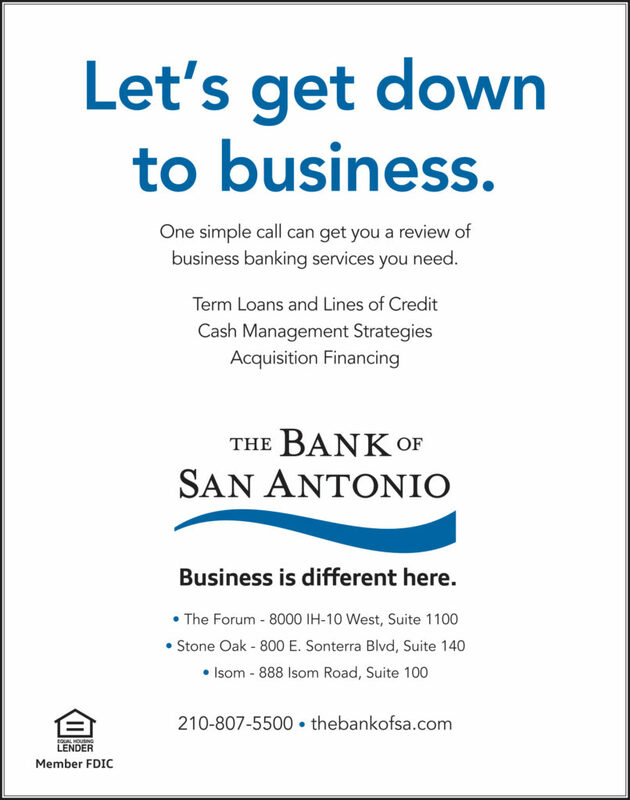 The Bank of San Antonio had positioned themselves strongly at a time of economic uncertainty due to the recession. Primarily a commercial bank, The Bank of San Antonio operated on a smart business model of not providing “risky” business loans, as well as growing their local footprint responsibly. Through a series discovery sessions and SWOT analyses, we were able to establish a unique aspect of their dedication to client service and their approach to providing a different brand of business banking. We discovered several standard practices that set them apart from other “customer-centric” commercial banks. These practices were grouped into five service promises that we leveraged in a series of brand and testimonial ads featuring well-known local business leaders, who were also actual clients of the bank. Client calls answered in person by a banker, or receive a call back within one hour. A staff comprised of business banking experts with an average of 20 years of commercial banking experience, in addition to products and services focused on businesses. The Bank of San Antonio would make recommendations for customized package of banking solutions based on a formal review of a client’s business operations. By offering exclusive workshops, networking sessions, and even mentoring from successful local business leaders, clients were provided with information and real world opportunities to help grow their business. 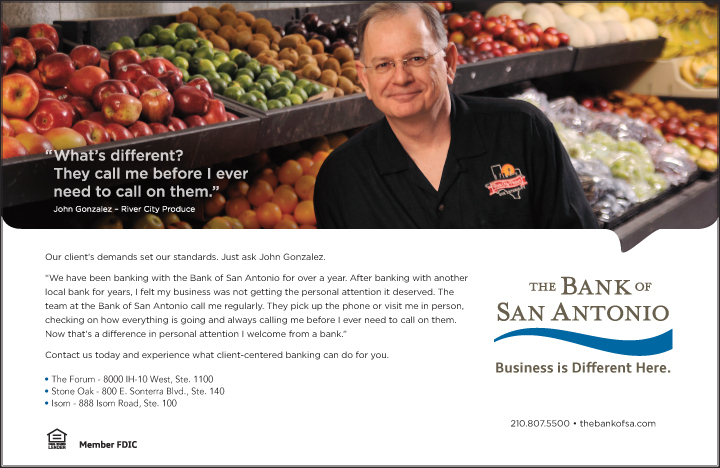 The established service promises have continued to be a part of The Bank of San Antonio’s corporate mantra and commitment to providing a unique customer service experience unlike any other business bank.